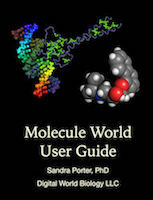 ****UPDATED April 2015**** This activity has been updated to use Molecule World, a user-friendly molecular modeling app for the iPad. Up to this point in the curriculum, students have seen the BRCA1 protein represented in a linear, sequence form. In this lesson, students are introduced to the importance of a protein’s three-dimensional structure. Students engage in a short activity first in which they use a chenille pipe cleaner stem to make a "protein" with a simple function, to illustrate the relationship between a protein’s structure and function. Students then learn to navigate between linear protein sequences and three-dimensional structures by using Molecule World. Students begin by viewing and manipulating DNA—a familiar molecule to students. When students are familiar with the program, students visualize parts of the BRCA1 protein to show how a specific mutation in the BRCA1 gene ultimately changes or destroys the protein’s function. In Lesson Five, students learn how 3D animators might use bioinformatics tools in their career. 1. Get Molecule World from the iTunes app store.